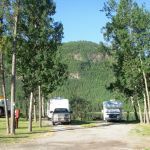 Ask fellow campers about "Toad River Lodge & RV Park" and nearby attractions. Our back-in site along the edge of the lake was spacious with trees between the sites. The pull-through sites in the middle of the park have no trees and are closer together. Loved watching the moose and beaver in the lake every day. The park was very quiet. The water is hard but tasted good. The 30 amp power was unstable with low voltage - our surge protector cut off our appliances at times. The staff was very friendly. We stayed 2 nights in our 40 foot motorhome. We camped at Toad River Lodge & RV Park in a Motorhome. Back-in site right up to the Reflection Lake shore. Staff was friendly and helpful, as much free firewood as you can use. There is a huge beaver dam (actually two) & lodge, swans, moose and great views. The site was mostly level and utilities were easy to reach. Each site has a fire ring and picnic table. There is a restaurant, store, lounge and an awesome, huge baseball cap collection. One of the best stops so far. Laundry $8 wash and dry. We camped at Toad River Lodge & RV Park in a Fifth Wheel. Wilderness. Tour the store/lounge and check out the huge collection of baseball caps. With patience you may get photos of beaver, moose, bear and water birds. The lake is actually the result of very industrious beaver that have built two dams to impound the water. Level gravel pull-through sites with 30 amps, water, sewer, a grill and picnic table. Other rigs are nearby, but not so close that there's any interference. Good cable and WiFi. Nice walk down to lake revealed beaver and ducks, and moose across the lake. Beautiful wildflowers blooming along the road and fence line. Across the road is the area school and a small aircraft landing strip. The gift shop is small with the usual tchotchkes. We didn't use the small restaurant, but heard good things from other RVers. As the evening progressed, less and less traffic meant the campground is very quiet. We would happily stay here again. We camped at Toad River Lodge & RV Park in a Motorhome. This is Toad River-a lodge, rv park, restaurant, and gas pumps (gas and diesel-$1.62/liter) all in one location. It is a nice park with gravel sites and grass strips between the sites. There is only 30 amp electric, but the full hook-up pull throughs were level and long and wide enough to accommodate big rigs. Each site has a charcoal grill and picnic table. It is a small park with cabins and rv sites. There are a few pull-thru sites and many of the back-in sites are on a small lake. There is a beaver lodge at one end of the lake and we saw beaver, ducks, geese,swans, and 2 moose across the lake. We camped at Toad River Lodge & RV Park in a Fifth Wheel. Campground sites on a lake with a beaver dam and resident moose family. We saw mother and baby moose swimming in the evening and bull moose swimming on our side of the lake the next morning. The sites along the lake are back-in, worth conveniently located utility hookups, level and packed gravel. We had a large fire ring, and there is a massive pile of free firewood. There are also pull-throughs and some sites along the highway side, as well as some tent sites with electric and a little outdoor kitchen. Bathhouse looks old's on outside, but is totally refurbished inside, beautifully done. The restaurant is good. We ate both dinner and breakfast there. There is a nice gift shop, repair facility, gasoline and propane on site. We found this campground to be an oasis in the middle of nowhere. Definitely the nicest so far along the Alcan. We find camping to be about the beauty of the scenery and the wildlife. If you can't appreciate that about this place, move on to a resort. We camped at Toad River Lodge & RV Park in a Motorhome. Eat bumble berry pie ala mode here. Delicious. Blueberry pie also delicious. Early in the season so very few people at the park. We have full hookups 30 amp, water and sewer. Easy to pull into site. When it became windy it was very dusty throughout park. It was fine for a one or two night stay. Can purchase gas at the restaurant. We camped at Toad River Lodge & RV Park in a Fifth Wheel. Visit Muncho Lake and the Northern Rockies Lodge. Lake is so pretty and the lodge was cute and staff very friendly. Saw plenty of wildlife on the drive. Very quiet setting on a beaver pond with active dam. Very close sites though and very basic. When they are busy you are told to just go see if there are any empty sites and let them know---not very professional. Rates are good, restaurant has good food as well. Has gotten better over the last several years but is still a basic rv campground. We camped at Toad River Lodge & RV Park in a Fifth Wheel. An ok place to stay overnight in the middle of nowhere. Summer time is very busy and reservations are almost mandatory. Rates are good, sites are very small, tight, and just a basic parking place for your rig. Very few other options though. What a gem of a park and a pleasant surprise. Beautiful setting, pull through and back in sites. Roads and sites are packed rock and sites are level. Located in a mountain valley, this park by a small lake. 30 amp power, cable TV, free wifi works well. Had a delicious lunch in the lodge restaurant, and topped off my fuel tank for the next leg of our trip. If we had realized it was this pleasant we would have scheduled more nights here. We camped at Toad River Lodge & RV Park in a Fifth Wheel. Our second year staying here. Nice facility and great hookups. 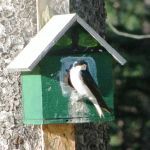 Free firewood and often see swans, moose and beavers around the lake. Great staff. Highly recommended !! We camped at Toad River Lodge & RV Park in a Travel Trailer. This is a combination Lodge with cabins and RV park. The campground has a level gravel surface with grass between some sites and some trees around the perimeter. We arrived without a reservation and were placed in a row (site # 2 to 5) of back-in full service sites close to the highway. While a little noisy during the day, by about 8:30pm there is no traffic. Our full service 30amp back-in site was $34.13 Cdn with GS discount. There are a number of lakefront back-in sites and there are 5 non-lakefront pull-through sites (#18 to 22). With a government power station just down the road, electricity is reliable and a full 30amp. All sites have a picnic table and fire ring. There is free WiFi (reliable, fast and accessible from all sites) and free firewood. Laundry is $7 for one load of wash and dry. Diesel = $1.32/L, gas = $1.39L, propane is by the tank at $1/L. There is a restaurant in the main building with a good selection of souvenirs and some fishing supplies, though there are NO groceries. There is no cell phone reception. And of course there is the famous collection of 10,918 hats on the ceiling (as of June 24, 2017). Like several places along the AlCan, they sell cinnamon buns, however the one we had was stale. For lunch one day I had a bison burger (couldn't tell the difference from a regular hamburger) and my wife had a clubhouse. The sandwich was served on thick homemade bread. The thin slices of deli chicken, as opposed to fresh baked, was a disappointment, but the excellent homemade French fries helped make up for that shortcoming. We camped at Toad River Lodge & RV Park in a Fifth Wheel. A rustic oasis in the wilderness! Extremmely clean and well kept. Restaurant on site. Gas/propane on site. And a moose visited in the lake behind the campground! We camped at Toad River Lodge & RV Park in a Travel Trailer. 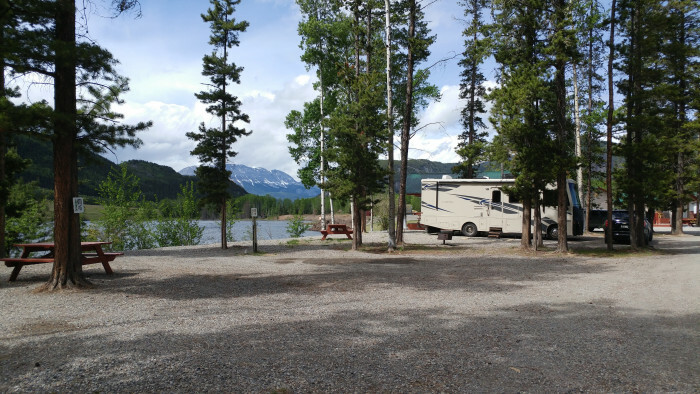 This park is located in a beautifu setting - tree covered mountains, snow capped mountains, adjacent to a river, lake (we saw a female moose feeding in the water on the opposite side of the lake). Nearby restaurant (with hundreds of hats nailed to the ceilings) and diesel fuel is available. Park is dusty from road dirt but this is a fact of life when traveling the Alcan Highway. There is some road noise from traffic on the Alcan but, again, this is normal. Sites are level and spacious. Would love to stay here again. It was a welcome sight after dealing with the Alcan bumps and gravel areas. A very pleasant surprise for a town with a population of 75! We camped at Toad River Lodge & RV Park in a Fifth Wheel. Rate reflects discount and exchange rate. We had a pull thru level site with the utilities in the proper area and in good working order. They also have free firewood for their guests. This area was loaded with moose and bear. We had a great stay and enjoyed the area. We camped here in a 40' motorhome. We camped at Toad River Lodge & RV Park in a Motorhome. The back-in sites back up to the lake and offer beautiful views. The pull-through sites are level and in the middle of the campground. If we had known the back in sites were so much prettier, we would not have asked for pull through. The wifi worked very well from our site. Posted cost for one load of laundry - $6.00! Café and gas station also on site. Free fire wood. We camped at Toad River Lodge & RV Park in a Travel Trailer. Enjoyed a beautiful sunset over the lake and had a nice meal for supper at the café. Beautiful park on the Alaskan Hwy that offers full hookup sites beside a pond with snow-clad mountains in the distance. Great wifi and plenty of room for big rigs. Beware the check-in woman who offers no help to find your site and who claims to offer Good Sam discount, but doesn't. 2017 rate is $35cdn for everyone, which is not bad for what you get. 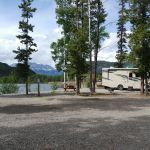 We camped at Toad River Lodge & RV Park in a Motorhome. Be sure to observe the beavers. Others that I've talked to who have camped here mention seeing moose. Unfortunately, we didn't see any. Great place to relax, catch-up on your blog and e-mails, read a book. Whatever, take a breather. Checkout the "world famous" hat collection in the lodge and read more about Toad River in Wikipedia and at the website for the Northern Rockies Regional Municipality, of which Toad River is a part. Check out the hats on the ceiling of the Toad River Lodge restaurant. There are over 10 thousand hats in the collection. Not much to do other than sit back and relax. Food was good in restaurant. Be sure to watch for moose in and around lake a.k.a. Very large beaver pond. We would definitely stay here again - 5*!! 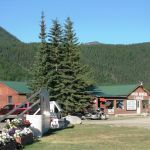 Are you affiliated with Toad River Lodge & RV Park ?